View EXIF, IPTC, and XMP metadata associated with an entry, right on the media detail page. The information boxes can be found below the media stats and groups section. Click the downward arrow to expand the info box and access additional details that are stored within the file. The data is also available via FileInfo and MediaList components as well as the getFiles and getFileInfo API calls. 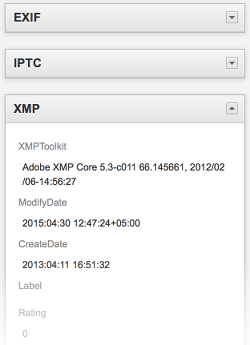 Be the first to comment on XMP, IPTC, and EXIF Data.